Arrow truck canopies are manufactured in British Columbia, Canada. 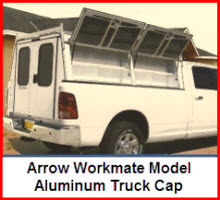 Arrow Truck Canopies have been manufactured by the Arrow Truck Caps folks since 1979. The company has grown to be one of the most popular truck canopy manufacturers in Western Canada. 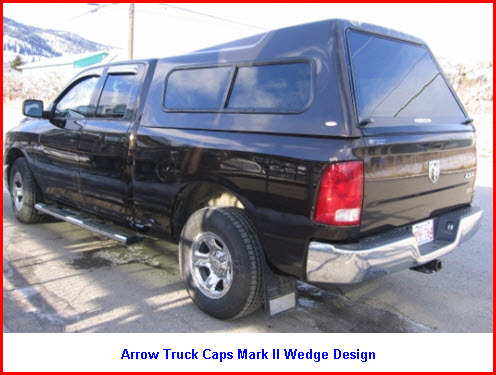 And if you don't like their truck canopies, which is hard to believe, Arrow Truck Caps is also the exclusive Western Canadian distributor of SnugTop truck caps. So they're definitely a company that gives you options. 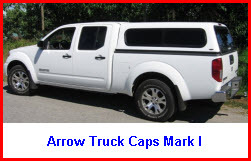 Arrow makes a full line of fiberglass truck caps which includes the Mark I, the Mark II, the Mark III and the Matrix models. Arrow says their fiberglass truck caps are constructed utilizing NASA inspired products; lots of fiberglass chop, DuPont quality paint with clear coat, extra durable windows and locking rear doors. They are into sleek styles and continuously build new molds for the newest model pickup trucks while preserving their signature designs. 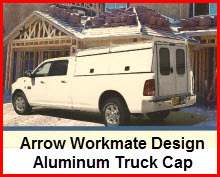 Arrow also manufactures a commercial aluminum model, the WorkMate, for those who use a truck cap for real work or serious play. So you can get a Mark I cab high design, a Mark II with a wedge design, a Mark III high rise design and the Matrix design with recessed windows and doors. All 4 designs are custom one-piece molds. Your choice. Here are some additional features, most of which are common to any of the 4 above mentioned designs, that might get you to lean towards the purchase of one of these Arrow truck canopies. - Cab height from 20" to 36"